Tailor Made Products present the Scarlet Original Party Pal - Designed to keep one hand completely free, while enjoying your favorite munchables and beverage. 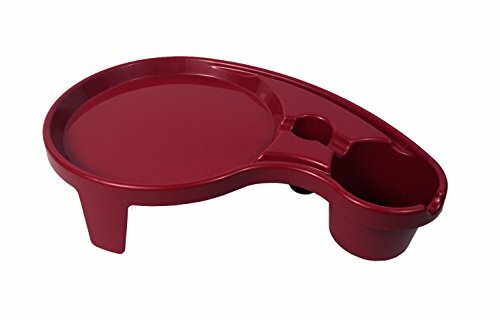 Stays balanced and comfortable due to patented, ergonomic creation needing only a forearm as support: loaded or empty, they sit on any flat surface Easily holds a standard 9 inch plate, plus an up to a 32 ounce glass, can, bottle, or paper cup; also has a handy-dandy compartment for utensils and a napkin. Arrives as a complete pack of 6 (six) Silver Party Pals with dimensions as 16-inches x 10-inches x 6-inches; all Dishwasher Safe. With a commitment to quality, Tailor Made produces high quality, unique kitchen tools, storage options, and organization merchandise, all lovingly made in the USA. Our products are safe, innovative, and of exceptional value for use in food preparation of delicious, creative meals and beyond. Taylor Made provides rock solid values of honesty, integrity and dependability - the very foundation of the company relationship with customers, employees, and various communities with which we engage. We aim to inspire home cooks with kitchen gear that performs extraordinarily well, is visually stimulating, and easily affordable. Tailor Made Products also embrace a fervent commitment in steadfastly upholding our promise to the principles of honesty, independent thinking, and candor as foundations for fruitful, enduring relationships with customers, employees and the communities in which we engage. If you have any questions about this product by The Original Party Pal, contact us by completing and submitting the form below. If you are looking for a specif part number, please include it with your message.